Mr Owaisi said that when Muslims and Dalits were targeted across India, no such incident was reported here. 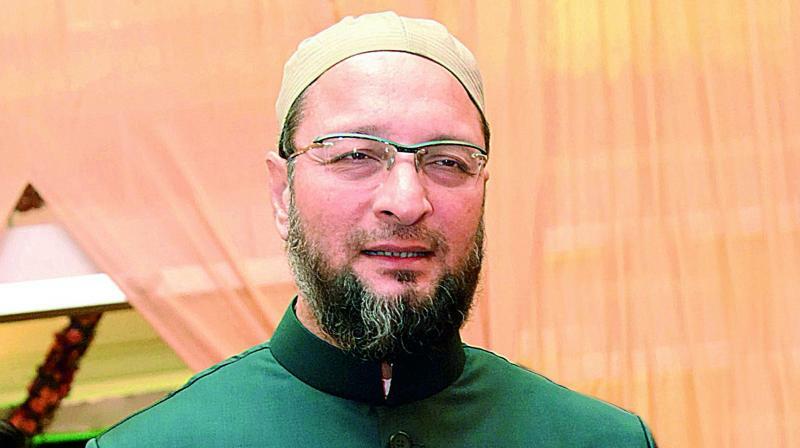 Hyderabad: MIM president Asaduddin Owaisi said Telangana state was the most progressive in India and the safest place for Muslims, Dalits and women. Addressing public meetings at Maqta Madar Sahab, Khairatabad and Musheerabad in support of TRS candidates, Mr Owaisi said that when Muslims and Dalits were targeted across India, no such incident was reported here. The MIM chief said incidents of mob lynching had sent the message that Muslims and Dalits “were not citizens of the first category; you are not shareholders but the renter”. Mr Owaisi said Hyderabad is free from riots and no Muslim was targeted in the name of beef. “In Hyderabad any woman can return home at midnight. Muslims are safe here,” he said. He said that when the MIM supported the TRS, TPCC president Uttam Kumar Reddy asked him to reveal details of the deal. “Yes a pact was executed. We asked KCR to remove educational backwardness and the government opened more than 200 residential schools where 50,000 students are provided quality education, one lakh poor Muslim girls were helped with monetary aid on their wedding,” he said.